Kitchen Window: Nuts For Nutella There are many other brands of chocolate-hazelnut spreads, and it can even be made at home. But for food writer Monica Bhide, there is only one Nutella. This sweet, cheerful reminder of her childhood inspires recipes and serving suggestions from fellow fans near and far. Get recipes for Petite Nutella Pochettes, Dorie Greenspan's Nutella Tartine, Co Co Sala's Nutella & Crispy Treat Quesadilla, Sala Kannan's Nutella Ice Cream, and Soma's Nutty Nutella Swirls. My first introduction to Nutella was under unpleasant circumstances. While the incident took place more than 30 years ago, the memory of it remains crystal clear. I was a curious 7-year-old and loved dissecting things to figure out how they worked. In my zeal, I "dissected" my father's new stereo system. I used a screwdriver and opened the entire system, speakers included. After examining the contents for a bit, I tried to put it back together. My father walked into the living room and glared at me. He opened his mouth to say something, but all I could see was the anger in his eyes. He just stood there shaking his head and began to show me how to fix the system. I watched for a while and then quietly crept away to my room, ashamed and terrified. A few days each week before school, my mother would hand me some money to buy something for myself. And each time I would buy the same thing: a small container of Nutella with its own plastic spoon. My father, who is an engineer, knew how to put the system back together. After the stereo was reassembled, Dad came to my room. He had heard me crying. I was petrified that I was going to be punished. Instead, my father was holding a tiny white plastic container with a mini white spatula. On the cover of the container was a picture of a slice of bread smeared with chocolate. I opened it, dipped the spatula into the mound of stuff, and tasted. The silky, creamy sweet melted instantly on my tongue, its hazelnut flavor filling my mouth with new sensations. Suddenly, all was well with the world again. I had stopped crying and Dad explained that while he was happy with my curious nature, I should wait for him before opening up any other electronic equipment. I grew up to be an engineer, so the curiosity never left me. After that first taste, a few days each week before school, my mother would hand me some money to buy something for myself. And each time I would buy the same thing: a small container of Nutella with its own plastic spoon. I used to stop by the same store so often that the owner took to calling me "the chocolate girl." From those childhood days to the present, Nutella has been a great buddy. A buddy that I can turn to when the petunias die, when the school nurse calls to say there is breakout of lice in the school (again), when my book manuscript gets soaked in the pouring rain, when my MAC backup is nowhere to be found. Of course, it is also a buddy through sunshiny days, but I admit that I have a dark side when it comes to Nutella: I hide it from my family, all of whom are Nutella fans. If anyone sees it, I know it will be finished before I can blink. The French adore Nutella. "It is impossible to overestimate the French love of Nutella, the chocolate and hazelnut spread invented in Italy about 70 years ago and eaten with gusto all over most of Europe," Dorie Greenspan writes in Around My French Table. "If you think about how attached we Americans are to peanut butter, you'll have an idea of how much the French love Nutella. It's a perennial at crepe stands all over the country, sometimes along with bananas. Spread on a slice of bread, it's often the after-school snack of choice." Nutella makes a great substitute for jelly in PB&J sandwiches. We freeze grapes and then dip them in warm Nutella for a snack. Sliced bananas, slathered with Nutella and topped with crushed walnuts and raisins, is our family take on "ants on a log." Waffles drizzled with warm Nutella are a match made in heaven. Crepes with warm bananas, honey and Nutella are delightful. My kids occasionally make a pound cake Nutella sandwich: Slather Nutella on pound cake, layer with slices of strawberries, bananas and mint leaves and top with another slice of cake. We melt Nutella in the microwave (just a few seconds) and serve it as a dip with fresh fruit and marshmallows. I mostly don't really "cook" with Nutella other than to spread it or warm it and drizzle it or layer it with things. I thought I was the only one, but I was happy to learn I was wrong. Baker and writer Dorie Greenspan also loves Nutella. "The most cooking I've ever done with Nutella is to warm it to drizzle it over the tartine or an ice cream sundae," she told me. "My tip for cooking with Nutella would be to not cook it. I think it's best used just as it is. It makes a great under-layer to a ganache tart or even a tart that's filled with pastry cream and topped with fruit. I like when it's a surprise — when it's hidden and you don't know it's going to be there until you cut into the tart or cake (of course Nutella makes a good filling for a layer cake)." So, yes, I make some of these recipes, but nothing tastes better than Nutella out of a jar, straight up. I should know. After all, I am the chocolate girl. "I fell in love with Nutella in the '80s, when I studied abroad in France, and the kids in my host family's house ate Nutella every morning. I couldn't believe I had grown up eating plain old toast. I felt cheated out of years of breakfast bliss," says Melissa d'Arabian of Food Network's Ten Dollar Dinners. 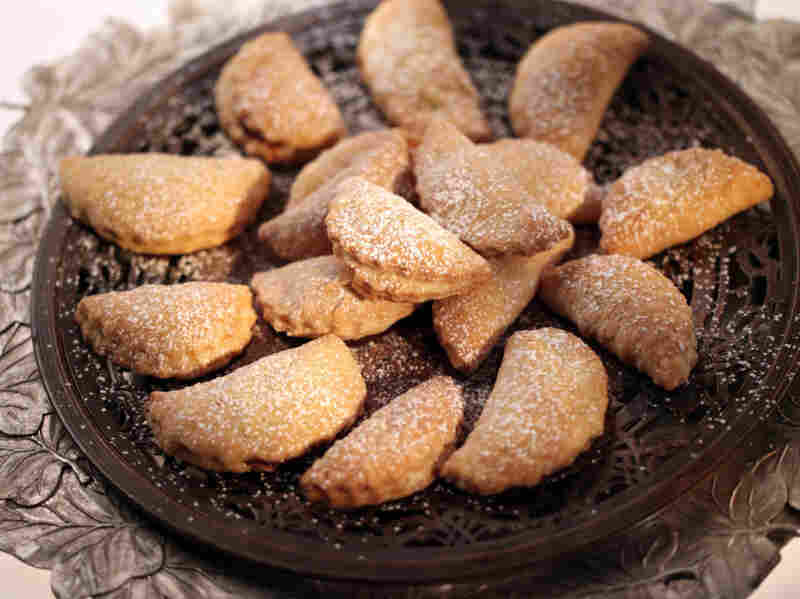 You will need a 3-inch fluted biscuit cutter for this recipe from d'Arabian. In a medium bowl, using a hand mixer, cream the butter and cream cheese together until light and creamy. Add the flour slowly until the dough forms. Do not overmix. Shape the dough into a ball and cover. Let the dough rest in the refrigerator for 30 minutes. Preheat the oven to 375 degrees. Line one or two baking sheets with parchment paper. On a lightly floured surface, using a lightly floured rolling pin, roll out the dough to 1/8-inch thickness. Using a 3-inch fluted biscuit cutter, cut out as many circles as you can. Form the scraps into a ball and reroll to make more circles. Fill each dough circle with a small spoonful of Nutella. Dip your finger in tap water and spread on the edge of half the circle to help create a seal. Fold the dough over to create a crescent. Crimp the edge with a fork. Place the pochette on the baking sheet. Bake until golden, about 15 minutes. Cool, then sift the confectioners' sugar on top and serve. Just as American chefs have been known to use peanut butter to create grown-up desserts that recapture the pleasures of childhood, so French chefs find surprising ways to make Nutella chic. 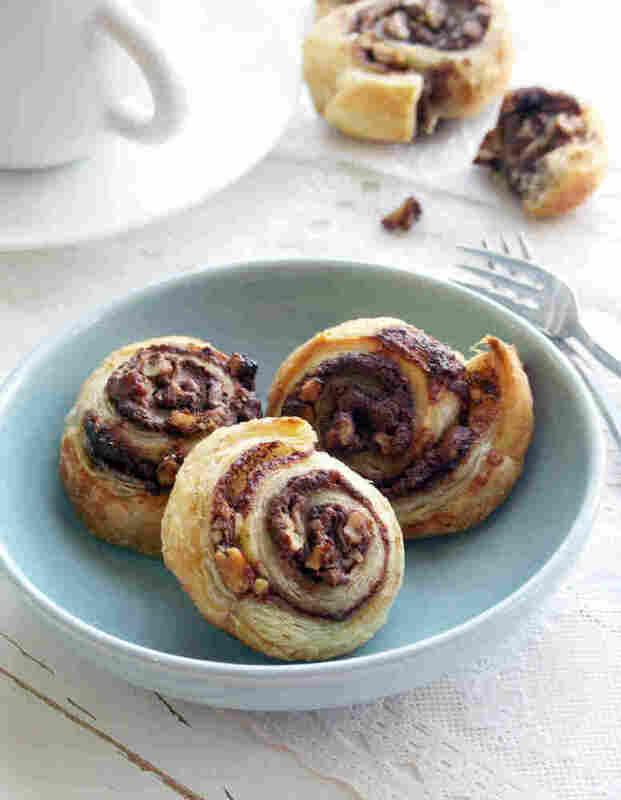 In her book Around My French Table (Houghton Mifflin Harcourt 2010), Dorie Greenspan adapts French pastry chef Pierre Herme's interpretation of the after-school treat pain au chocolat. The bread is brioche (or challah), the chocolate is Nutella and the surprise is orange marmalade. "Although it's a play on an after-school snack, this tartine is also made for a strong espresso," writes Greenspan. Preheat the broiler. Line a baking sheet or the broiler pan with aluminum foil. 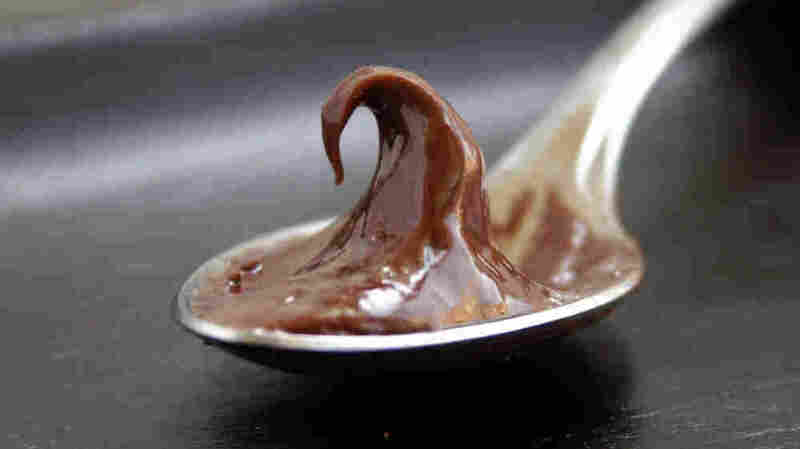 Put the Nutella in a heatproof bowl set over a pan of simmering water and heat, stirring frequently, just until it is softened and warm. Brush one side of each slice of bread with melted butter, and put the bread, buttered side up, on the baking sheet. Run the bread under the broiler; pull it out when the slices are golden. 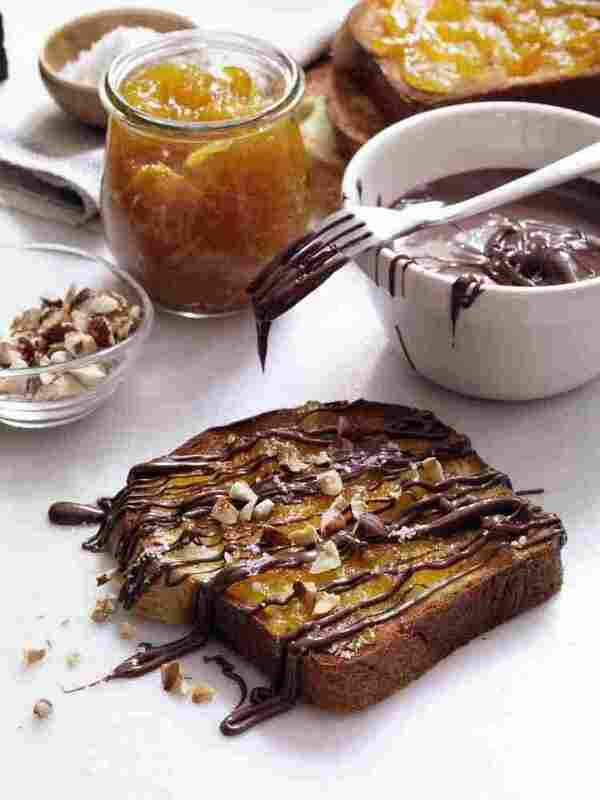 Spread the marmalade over the hot bread and then, using the tines of a fork, generously drizzle each tartine with some warm Nutella. Top with a few grains of fleur de sel and some chopped hazelnuts. Chef Santosh Tiptur heads the kitchen at Washington, D.C.'s only coffee and chocolate lounge, Co Co Sala. He shared a really fun recipe with me that my kids now love. 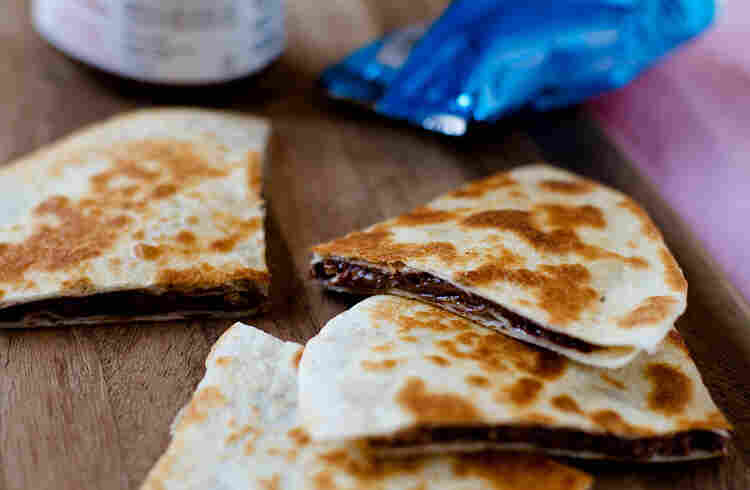 Spread 2 tablespoons of Nutella on each tortilla, making sure not to spread it all the way to the edge. Cut the Rice Krispies bar into small pieces and place on top of 1 tortilla. Sprinkle with other toppings, if desired. Sprinkle very lightly with sea salt. Top with the other tortilla, Nutella side down. Remove from the pan and cut in 4 to 6 wedges. Serve with ice cream or whipped cream, if desired. I am an avid reader of Sala Kannan's blog, Veggie Belly, and when she told me she had a recipe for Nutella ice cream, I just had to try it. Place the milk, cream, sugar and espresso in a saucepan. Cook on medium-high heat, stirring occasionally, until it starts to boil. Turn off heat and immediately add the salt, vanilla and Nutella. Whisk until the Nutella is fully melted. Chill the mixture in the fridge for about 30 minutes or until it is cold. Process in an ice-cream maker, according to manufacturer's instructions. Store the ice cream in the freezer. Soma Rathore of www.ecurry.com makes these lovely swirls that my family is now addicted to. Her advice on handling puff pastry: Do not allow the sheets to get too soft, or it will be difficult to work with them. If they do get too soft, chill them in the refrigerator for a few minutes. Thaw the frozen puff pastry sheets for 30 to 40 minutes at room temperature. The sheets should be slightly stiff, but soft and pliable enough to fold/bend without tearing. 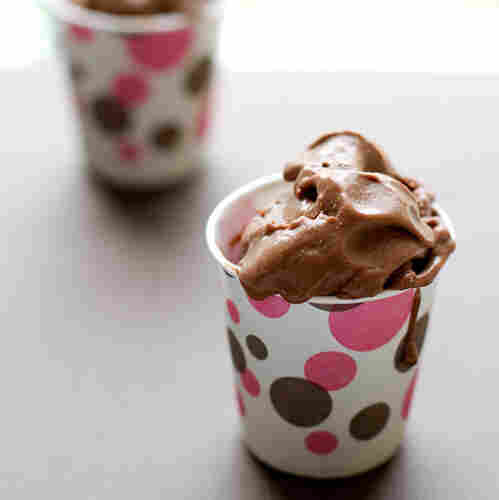 Place the Nutella in a heat-proof bowl and heat in the microwave for about 15 seconds. Add the orange extract/orange blossom water and whisk it until smooth and silky. Take 1 pastry sheet, and spread one third of the Nutella on it, leaving a little bit of space on the edges, so the Nutella does not ooze out when rolled and baked. Sprinkle one third of the toasted nuts evenly over the Nutella. Hold the 2 ends of the shorter side of the strip and tightly roll the strip into a cylinder. Seal the end/edges with a wet finger; press it down well so it does not come apart while baking. Brush the pastry roll with melted butter. With a very sharp knife, slice each roll horizontally into 3 to 4 swirls. Repeat with the other 2 pastry sheets. Roll all of the swirls in sugar and bake for 12 to 15 minutes, or until golden. Remember that dark baking trays will bake the pastry faster, so keep an eye on them while they are baking. Remove from the oven, cool for about 10 minutes and serve.